I am not sure if the world is less BAMF, or I have just been lazy, but it seems like it has been a while since we’ve had a real person of BAMFness. 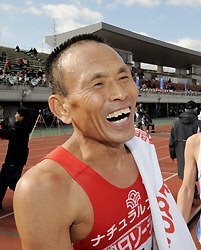 Fortunately, it appears it was just a temporary glitch in the matrix, as Yoshihisa Hosaka came through in a big way for BAMFs everywhere en route to a 89th place overall finish at the 58th Beppu-Oita Mainichi Marathon on Feb. 1. His time for the marathon was very fast 2:36:30. Now, I know what you are thinking. 2:36:30? That is relatively pedestrian. Most Kenyan marathoners could do that on leg. And yes, that might be true. What makes Mr. Hosaka such a BAMF? It’s simply really. He’s 60. SIXTY. Six-Oh. That’s right, at an age when many people (but not you Mom) are listening to Robert Wagner encouraging them to reverse mortgage their home, waiting anxiously for the latest AARP bulletin, and popping Geritol, Mr. Hosaka is smashing records and running 5:58miles. Oh, he trains 30km (18.6miles) per day. YH, you are a BAMF. Thanks to Japan Running News for pointing out this BAMFness.